Winter bread wheat (Triticum aestivum L., 2n=42X, AABBDD) cultivars ‘Duster’ and ‘Billings’ have occupied significant acreages in the southern Plains for their outstanding yielding ability and baking quality. Hybridization between them, or more likely their descendants, provides breeders the opportunity to select simultaneously for wide adaptation, high grain yield potential, and disease resistance. We discovered QYld.osu-1BS for grain yield by using genotyping-by-sequencing (GBS) markers to map a doubled haploid (DH) population derived from Duster and Billings. 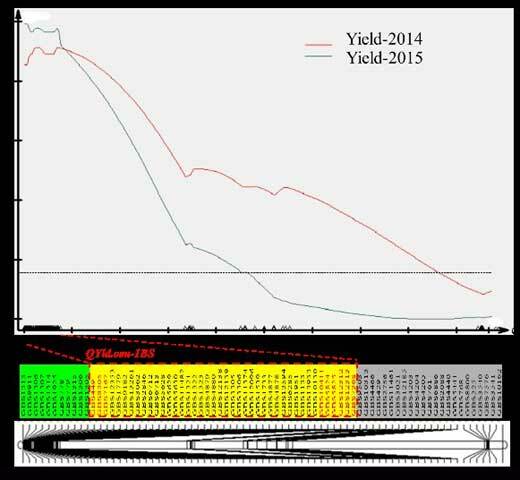 QYld.osu-1BS explained 23% and 24% of the total phenotypic variation in field-based grain yield tested in 2014 and 2015, respectively. Their identical long-term yield profiles in the southern Plains notwithstanding, the Duster allele at the QYld.osu-1BS locus increased yield by 16% in 2014 and 23% in 2015, relative to the Billings allele. QYld.osu-1BS is located in the distal region of the short arm of chromosome 1B. QYld.osu-1BS has been delimited within a 22 Mb region; however, no crossover was observed among 42 GBS markers mapped in the population of 260 DH lines. We have developed a new population to clone the yield gene on chromosome 1BS in Duster. We will also utilize this gene in cultivar development in wheat.